From the Cumberland Gap to the Atlantic Ocean, this is Virginia Water Radio for the week of July 7, 2014. This week, we feature two mystery sounds you probably hate to hear on a warm, summer day. Have a listen for about 20 seconds, and see if you can guess what large category of insects includes the creatures making these sounds. And here’s a hint: water rhymes with swatter. If you guessed flies, you’re right! 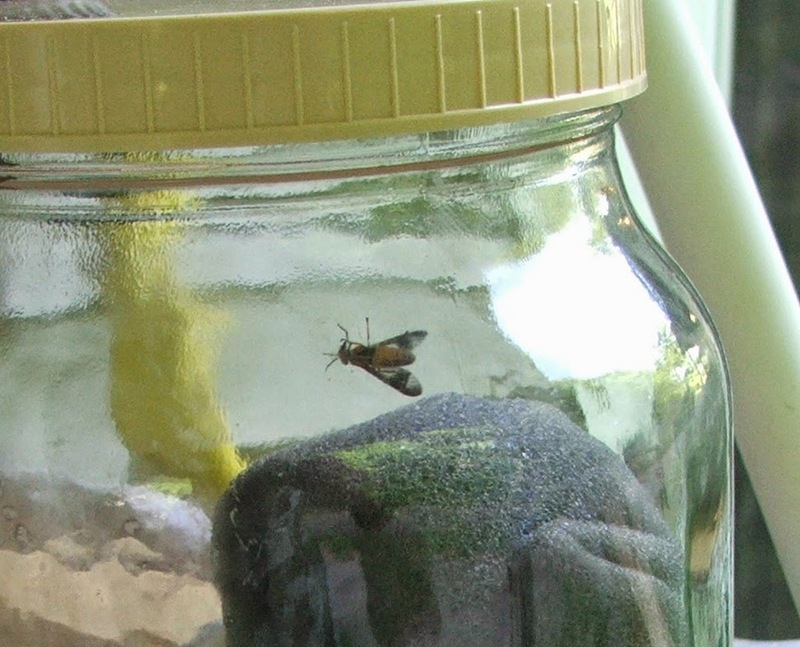 You heard annoying buzzing, first, one of the various species commonly called gnats, and second, of deer flies. Scientists include these and many other insect species in a large and diverse group called Dipterans, or true flies, characterized primarily by having only two wings as adults. True flies have a life cycle of complete metamorphosis through four stages: egg, larva, pupa, and adult. For many species, water is key to this life cycle: the larva and pupa stages are either semi-aquatic, developing in some kind of moist or wet area or material on land; or aquatic, developing in streams, ponds, or other water bodies. Perhaps the most well-known true-fly water connection is the infamous habit of mosquitoes for breeding in all kinds of standing water, from salt marshes to water-filled tree holes to discarded tires. Gnats buzzing; mosquitoes biting and transmitting disease; blackflies swarming—true flies are truly hard to like. But one can at least appreciate two important ecological roles played by true flies: recycling nutrients by breaking down various materials, from manure on land to leaves in streams; and providing food for fish, birds, bats, and other animals. In vast numbers in water, on land, and in the air, true flies have vast impacts. Deer fly collected from a wooded area in Blacksburg, Va., July 3, 2014. 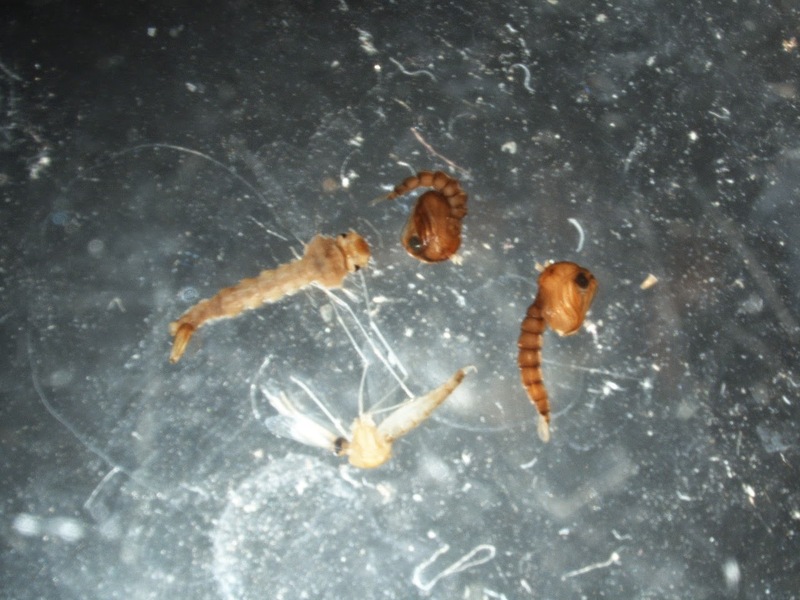 Three out of four parts of of the complete-metamorphosis life cycle in a “true fly.” Clockwise from left are a mosquito larva, two pupae, and adult. Collected from a roadside puddle in Blacksburg, Va., June 23, 2009. Micrograph (70x) taken on 7-7-14, courtesy of Eric Day, Virginia Tech Department of Entomology. Virginia Water Radio thanks Eric Day, Virginia Tech Department of Entomology, for providing information for this episode. The sounds used in this episode were recorded in wooded areas in Blacksburg, Va., on 6/29/14 (gnats) and 7/3/14 (deer flies). McCafferty, W. Patrick, Aquatic Entomology: The Fishermen's and Ecologists' Illustrated Guide to Insects and Their Relatives (Chapter 16: Midges, Mosquitoes, Aquatic Gnats and Flies), Jones and Bartlett Publishers, Toronto, 1998; available online at http://books.google.com/books?id=wiTq7x-fI_0C&dq=aquatic+gnats&source=gbs_navlinks_s. Merritt, R.W. and K.W. Cummins, eds., An Introduction to Aquatic Insects, 2nd Edition, Kendall/Hunt Publishing Company, Dubuque, Ia., 1984. North Carolina State University, “General Entomology/Diptera,” online at http://www.cals.ncsu.edu/course/ent425/library/compendium/diptera.html. Ohio State University Extension, “Midges and Crane Flies” Fact Sheet, online at http://ohioline.osu.edu/hyg-fact/2000/2129.html. Posegate, Ann, The scoop on gnats: the weather they like & why they drive us nuts, Washington Post, 7/26/11.